Imagine life without paper—no post-it notes, toilet tissue, espresso-to-go, plane tickets. But it’s so commonplace, we never think about how it got here. It’s just here. It’s been here for 2,000 years—a Chinese invention. In 105 AD, Cai Lun, an imperial inspector of workshops, returned from a papermaking research trip around China. When he presented the results to the emperor, he was dubbed the Inventor of Paper. But the oldest piece of paper extant, found in Shensi Province, dates from 140 BC, and we know that the Chinese began making paper in 200 BC. The first paper was coarse and thick and was used to wrap parcels; a special thick, pleated paper was even used for armour. By 93 BC, it was clothing. In 110 AD, people started writing on it then, in 589 AD, they started using it for, er, personal purposes. The word ‘paper’ comes from the word papyrus. But papyrus is different from paper. The Egyptians flattened stalks of the papyrus plant and stacked them in layers. When the stalks dried, they formed a flat material, perfect for writing on. The Chinese used bamboo, hemp, rattan, straw or mulberry bark. 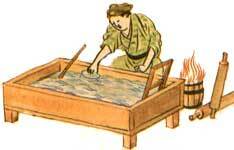 They soaked pieces in water, along with lye or potash, for 70 days, then beat and boiled the mixture into pulp. They added water and a fibre-lubricating solution taken from a type of birch tree found only in Sichuan Province. The fine screen was dragged through the pulp; when pulp is collected, the fibres become attracted to each other and mesh to create a strong bond. The resultant net-like sheets were peeled off and stacked. The stack was pressed to remove excess water, then the damp sheets were stuck to a heated wall to dry. Today, paper-making is a high-speed, high-tech form of this method, and wood chips are the base ingredient. The chips are steamed and stripped of lignin (the natural glue that holds fibres together). The fibres are cleaned and mixed with water, pumps spray pulp and water onto fast-moving screens, the water drains away, and the fibres join together. Vacuum pumps drain the water; large rollers squeeze the fibre, heated rollers dry it further. Starch or clay is added for an improved surface; a calender acts like an iron to polish it. These 100 metre-long papermaking machines have more computer controls than a 747. The romance is gone. But you can now see the ancient method, in action, at Vancouver’s Science World, which hosts China! 7000 Years of Innovation, a celebration of Chinese inventions that changed the world. This entry was posted in Art, Museum & Gallery Exhibits and tagged Business, Cai Lun, China, Chinese, chinese invention, material, Paper, Papermaking, papyrus plant, Pulp and Paper.